For children with sensory difficulties - those who struggle process everyday sensations and exhibit unusual behaviors such as avoiding or seeking out touch, movement, sounds, and sights - this groundbreaking book is an invaluable resource. Sensory processing challenges affect all kinds of kind - from those with developmental delays, learning and attenion issues, or autism spectrum disorder to those without any other issues. 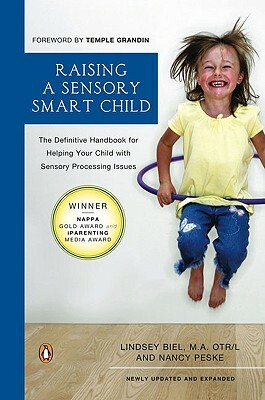 Now in its third edition, Raising a Sensory Smart Child is even more comprehensive and helpful than ever. * Ways to advocate for your child at school and make schools more "sensory smart"
Lindsey specializes in remediating fine and gross motor delays, visual perceptual skill development, enhancing daily living skills, and improving sensory processing issues. She also helps families and schools to make simple modifications at home and school to enhance a child’s ability to play, learn, and thrive. Lindsey is also the author of Sensory Processing Challenges: Effective Clinical Work with Kids & Teens, published by W.W. Norton Mental Health. She writes articles for both professional and parenting publications and is the co-creator of the Sensory Processing Master Class DVD program along with Drs. Brock and Fernette Eide. She is a popular speaker, teaching workshops to parents, therapists, doctors, and others on practical solutions for developmental challenges and sensory strategies at home, school, and in the community. Nancy Peske is the coauthor of the Cinematherapy series. She lives in Shorewood, Wisconsin with her husband and son, who was diagnosed with SI dysfunction when he was two.